- 100% Match for Class of 2019! Smile While You Shop on Amazon! Please support our work when you buy anything on Amazon by typing https://smile.amazon.com and search for the New York College of Podiatric Medicine as a charity you want to support. Amazon will donate 0.5% of the price of your purchase to the New York College of Podiatric Medicine. This is at no extra cost to you. I am pleased to introduce Drs. Jill Hagen and Lauren Grossman as the New York College of Podiatric Medicine's Featured DPMs. Jill Hagen, DPM is a graduate of Queens College, where she majored in Psychology and Communication. She then attended St. John's University College of Pharmacy and worked at Lenox Hill Hospital as a pharmacist. She decided to continue her path in medicine and was accepted to the New York College of Podiatric Medicine. While in school she continued to work 30 hours per week at a local Manhattan pharmacy. She graduated from NYCPM in 1989 and completed a two-year residency program at three different hospitals: Coney Island Hospital, St. Mary's Hospital, and St. Francis Hospital. Dr. Myron Boxer, DPM ('61) was her residency director and mentor. While a resident, Dr. Hagen worked with DC 37 Healthcare Center, treating the union members as their podiatrist, and also worked as a police surgeon for the NYS Troopers and Amtrak Police. Using her extensive background in medicine and business, she opened her own private practice in Englewood, NJ at The Dermatology Center in 1991. Dr. Hagen has spent twenty-eight years in the field of podiatry and performed over 20,000 surgical procedures. Dr. Hagen stands at the top of her profession. Dr. Lauren Grossman grew up in Norwood, NJ and started her path in medicine at the University of Massachusetts at Amherst for her undergraduate degree. Through the mentoring of Dr. Hagen, she applied to New York College of Podiatric Medicine. While in school, she continually visited Dr. Hagen’s office and learned about injections, office procedures, billing, and prepping for surgeries. She rose to the top of her class and won numerous awards in subjects including infectious disease, biochemistry and embryology, to name a few. Dr. Grossman graduated in 2009 and completed a two-year residency at New York Methodist Hospital in Park Slope, Brooklyn. For the past seven years she has worked with Dr. Hagen in Englewood, NJ. Within a few minutes of stepping into the office, I saw a bustling front desk with patients checking out after being treated for sports injuries, congenital abnormalities, diabetic wound care, and routine check-ups. The doctors also perform outpatient surgical procedures at Hackensack Hospital and a local surgical center. Both Dr. Hagen and Dr. Grossman emphasize treating the patient as a whole, taking into account each patient's specific history. For pre-clinical students starting their journey, Dr. Hagen advises them to stay away from any negative energy. She suggests that students, "keep their eyes on the bagel and not on the hole." Students should learn and spend as much time working in a podiatry office instead of just thinking about surgery. Both doctors agreed that the clinical preparation at NYCPM exposed students to a vast variety of podiatric cases, more than would ever be seen in private practice. Students should focus every moment and learn as much as they can. Dr. Grossman spoke about the growing field of podiatric medicine, how there is a great need for podiatrists and that this will continue for many years. They emphasized the value of helping the community whenever possible. They both have volunteered for the NYC Avon Walk for Breast Cancer and have treated runners at the finish line. They also promote local high school football teams in the town surrounding their office. Dr. Hagen explained that the three qualities needed for success in the field of podiatry are: great knowledge, great hands and dexterity, and great business sense. In addition, podiatrists must have amazing people skills with a dedicated bedside manner; having these qualities will take you far on the road to success. Dr. Grossman stressed the value of following up with every patient; both doctors call their patients after all surgeries. The most rewarding aspect of podiatry to Dr. Grossman is the ability to make her patients feel better right away and ease their pain. Dr. Hagen spoke about a situation where she was in the OR and was checking on a patient's vitals. She noticed a patient's blood pressure had spiked to 250/150. He was in a hypertensive crisis; she canceled his surgery and he was sent for proper treatment. Three months later the patient re-scheduled his surgery and told Dr. Hagen, "Thank you for saving my life." This is what podiatric medicine is all about and this is what is most rewarding to Dr. Hagen. In their free time, both doctors enjoy their workout schedule, especially spinning and running. Dr. Hagen is married and has a 25 year-old son who is a graduate of the University of Michigan. Dr. Grossman is married and has a four year-old son and a six year-old daughter. 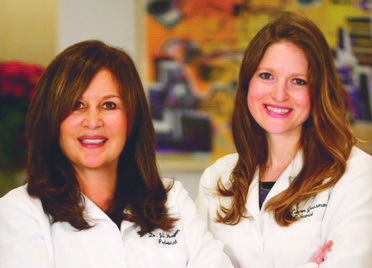 Dr. Jill Hagen and Dr. Lauren Grossman are leading women in the field of podiatric medicine. They are examples of podiatrists that combine medical expertise, business knowledge, and a genuine concern for the full well-being of their patients. They practice by the motto, "We love our patients, we treat our patients as family, and we are always available 24-7-365."